Here's my final graduation card for the Class of 2013! It's been fun sharing in these exciting times and seeing such great kids off to college! Only 4 weeks from today until our oldest leaves for school. I used the Freshly Made Sketch#97 here. 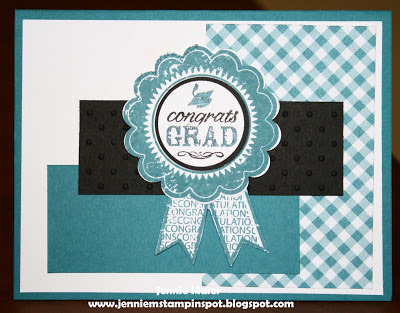 Of course, the Blue Ribbon stamp set and then some Gingham Garden DSP. 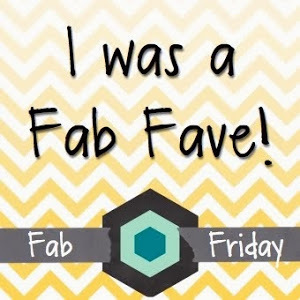 This is my take on the FabFri Sketch#23 here. 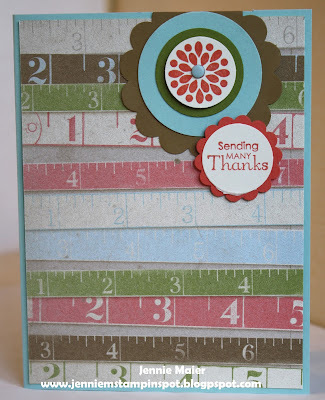 The stamp sets are Petite Pairs and Mixed Bunch with some Etcetera DSP. 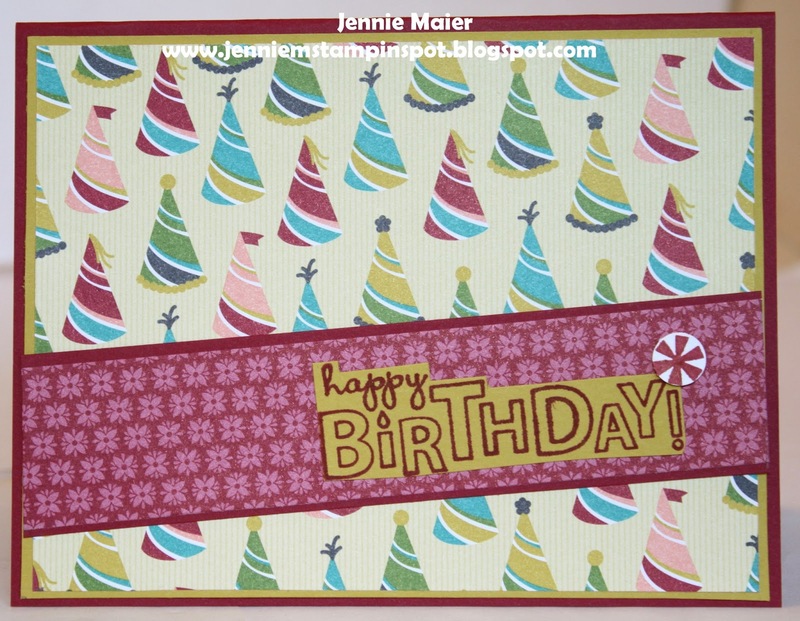 I needed a birthday card so I used the great sketch at Pals Paper Arts here. 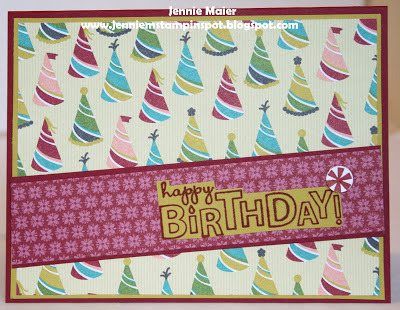 Some Birthday Basics DSP and the Embellished Events & Teeny Tiny Wishes stamp sets and it was done in a flash! I'm taking a break from graduation cards and needed a thank you for some friends, so I used the MojoMonday Sketch#303 here. Six-Sided Sampler is the stamp set with some Etcetera DSP. 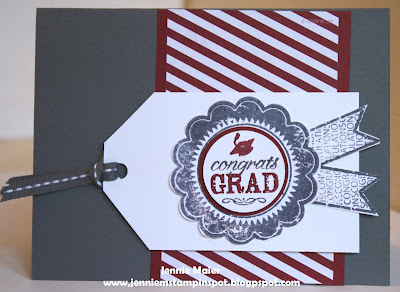 I hope you're not sick of all my graduation cards, but there are still two more parties coming up! I used the Freshly Made Sketch#96 here. 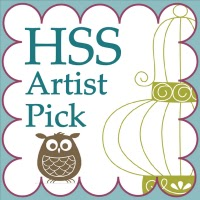 The school colors are maroon and gray so some Season of Style DSP Stack from the upcoming Holiday Catalog fit the bill. Blue Ribbon stamp set again. Four more graduation parties to go, so I used the Splitcoast Sketch#445 here. 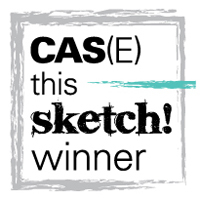 It was to use one of the past Splitcoast Sketches, so I chose SC433 here. Once again, going with the graduate's future school colors, black and yellow. And using the Blue Ribbon stamp set. New to me DSP too-Modern Medley. 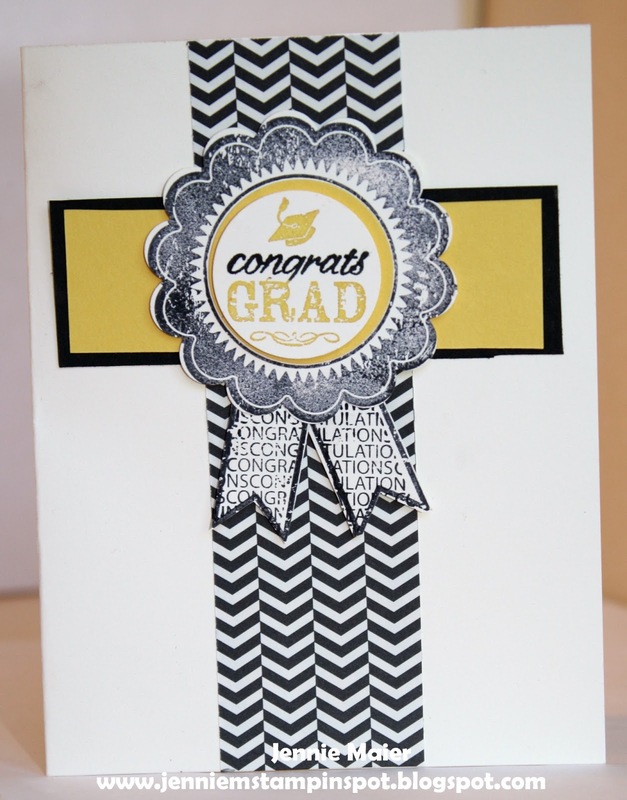 Here's another one of the many graduation cards I need and I used the Clean and Simple FTL#249 here. Again, tried to stick with the grad's new school colors. 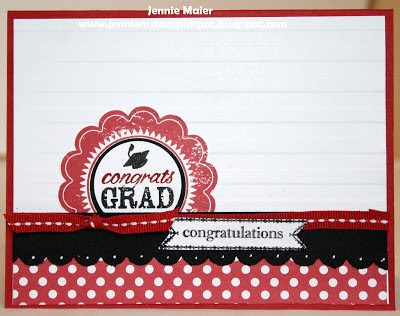 And of course, my only graduation stamp set, Blue Ribbon with the Itty Bitty Banners set too. 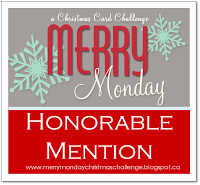 It's my nephew, Aaron's birthday coming up so I used the FabFriday Challege#22 here for this card. The challenge is to use the colors Real Red, Temping Turquoise and Basic Gray. 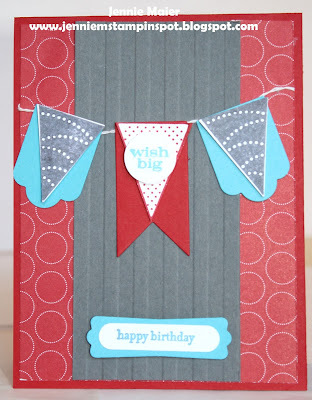 I saw this card by Nicole Turgul and changed mine up a bit. 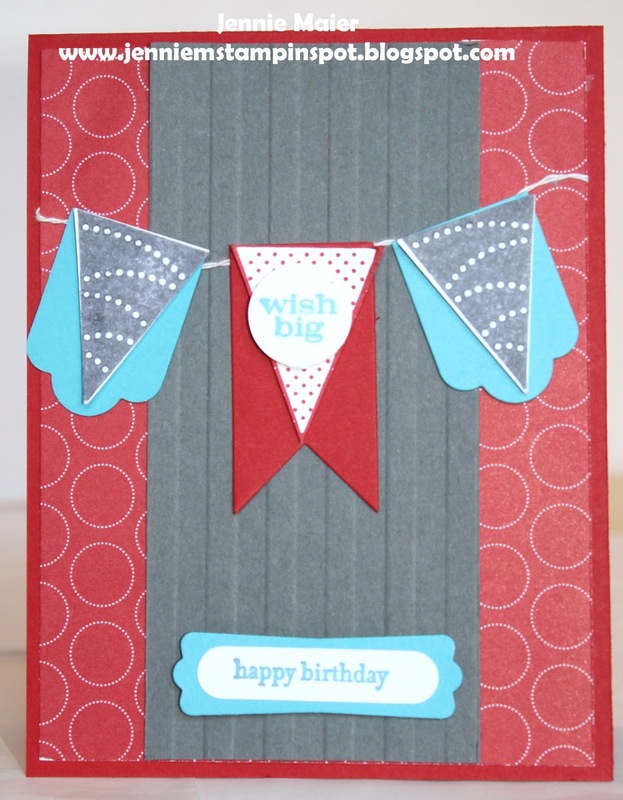 I used the Pennant Parade and Teeny Tiny Wishes stamp sets with some Polka Dot Parade DSP and lotsa accessories. It's my beautiful daughter, Abby's 17th birthday today so I made this colorful card for an equally colorful, bright and funny young lady! 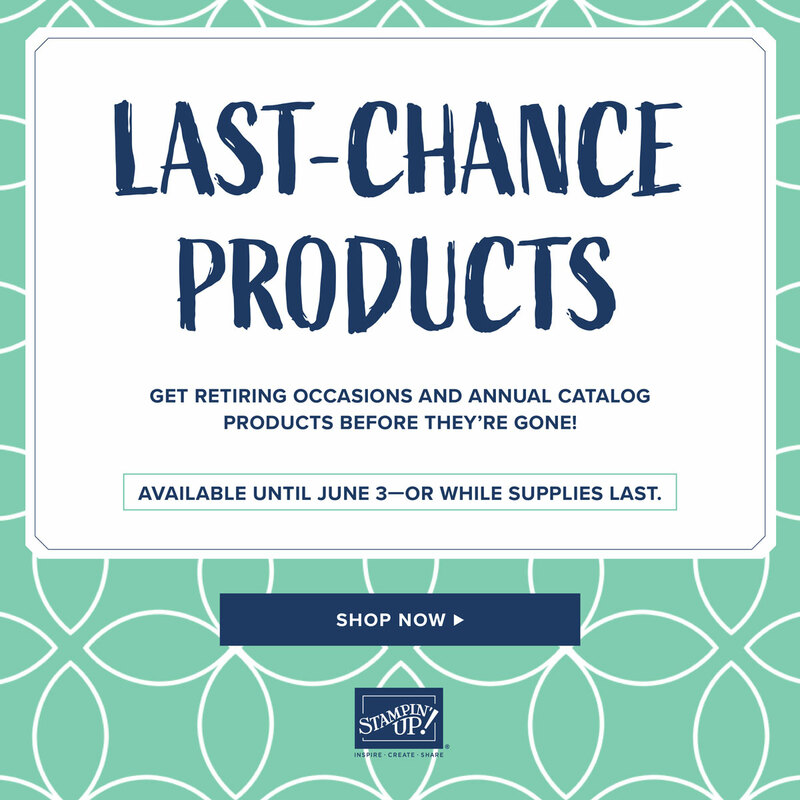 The stamp sets are You're Amazing and Six-Sided Sampler. 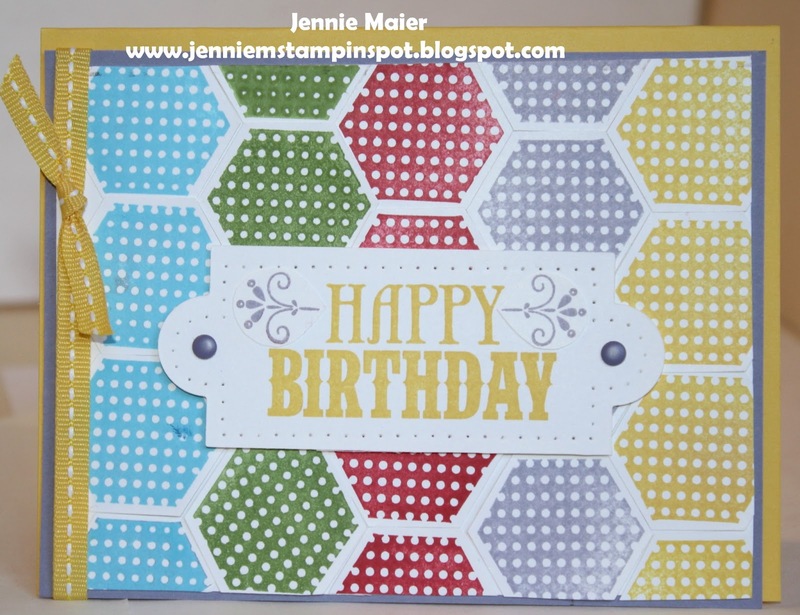 I used the coordinating Hexagon punch to create the background that was inspired by the wrapping paper in the picture. Off to celebrate the day! I got my order with the DSP special and had to play! 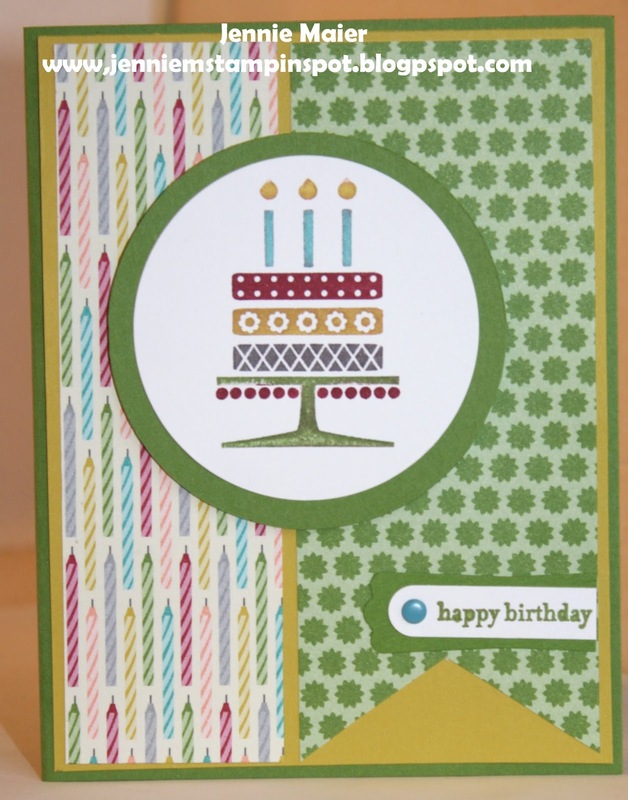 I used the Freshly Made Sketch#94 here, along with some Birthday Basics DSP and the Bring on the Cake and Pennant Parade stamp sets. 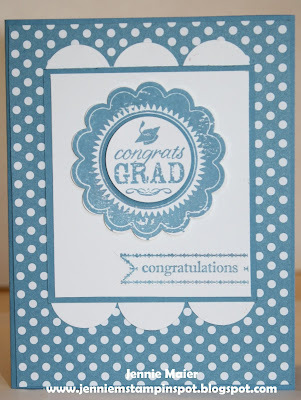 Now I'm down to 5 more graduation cards that I need to make! 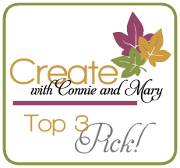 For this one I used the Create with Connie & Mary #259 here. 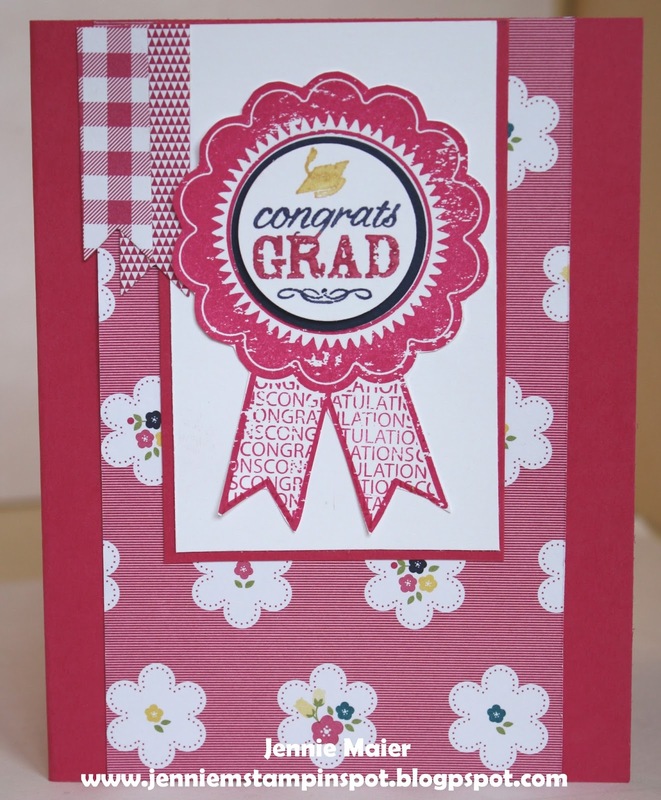 This card is for a young lady who is off to the University of Wisconsin-Madison (along with my daughter), so I used their school colors, and my favorite-red! 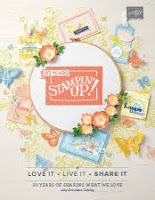 More Blue Ribbon stamp set and the Itty Bitty Banners stamp set too. 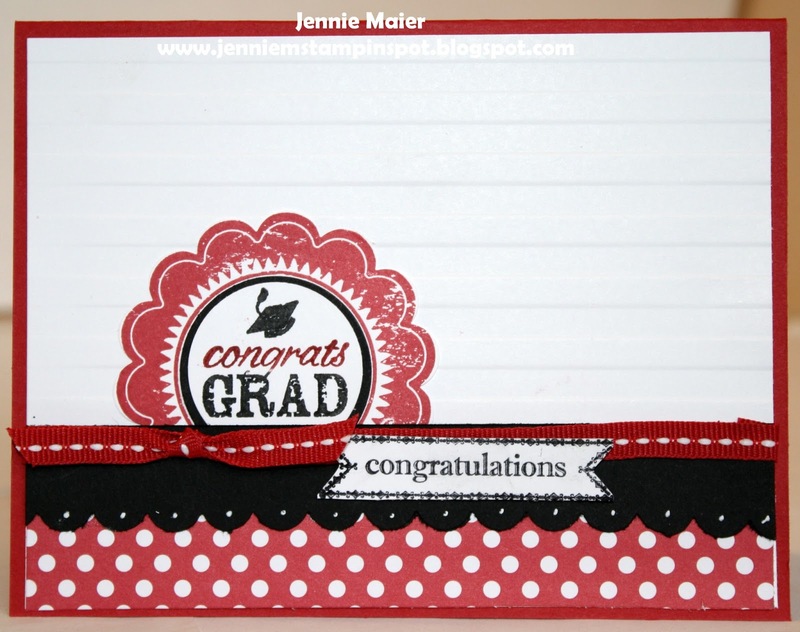 Another Graduation Card with a Mojo Sketch! We have 6 more graduation parties, so I needed another graduation card. I used the MojoMonday Sketch#301 here. The only set I have with graduation in it is Blue Ribbon. 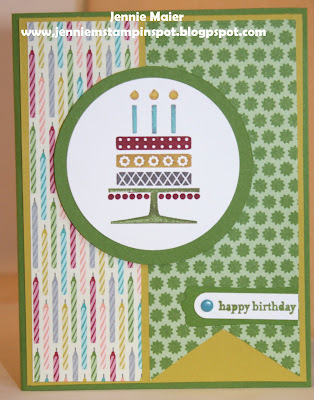 And while I await my new 2013 DSP, I used some Gingham Garden DSP. 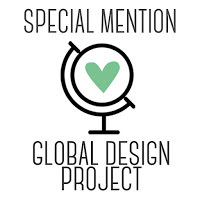 The Island Indigo is perfect because the grad's school colors are blue, black and white! 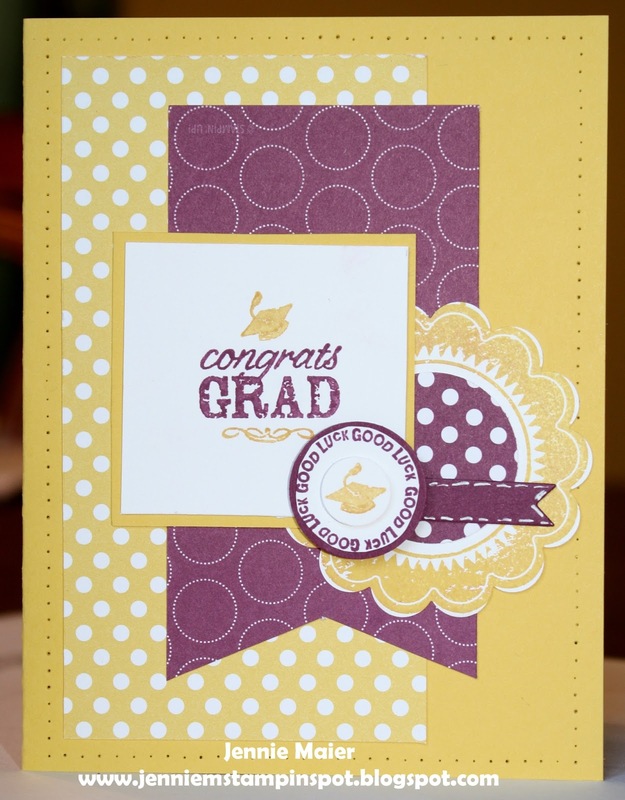 This graduation card uses the MojoMonday Sketch#300 here. 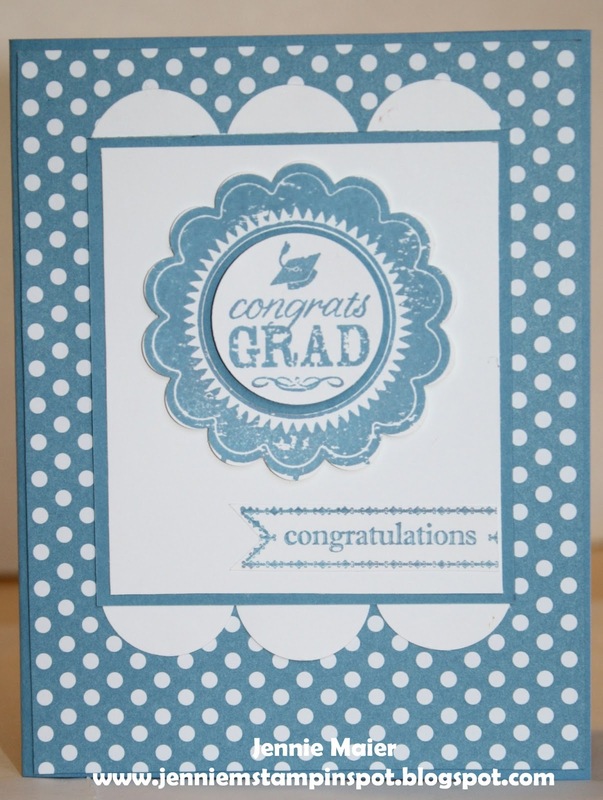 It also uses the Blue Ribbon and A Fitting Occasion stamp sets with some Polka Dot Parade DSP.